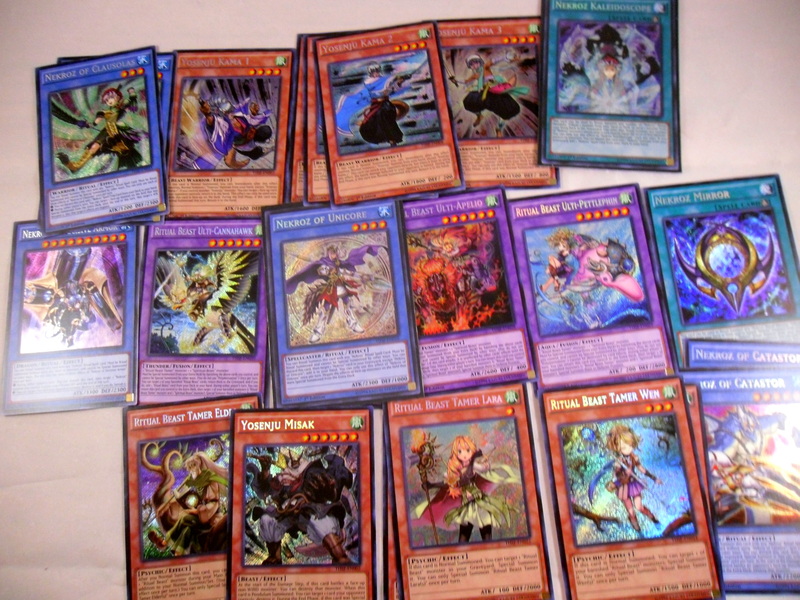 So I’ve come to the decision that I will build the Nekroz deck. After buying 3 boxes and pulling 2 of the rarest and most expensive card (Nekroz of Brionac, currently at $129) I feel fate is telling me something. However, I have limits and the same limits that made me resist buying a play-set of Thoughtseize at $19 a card, also makes me hesitant to buy a play-set of Nekroz of Valkurus for $68 each. I’ll go in-depth with this at a later time. The simple fact is Brionace has dropped from $170 to $130 in the span of 2 weeks. 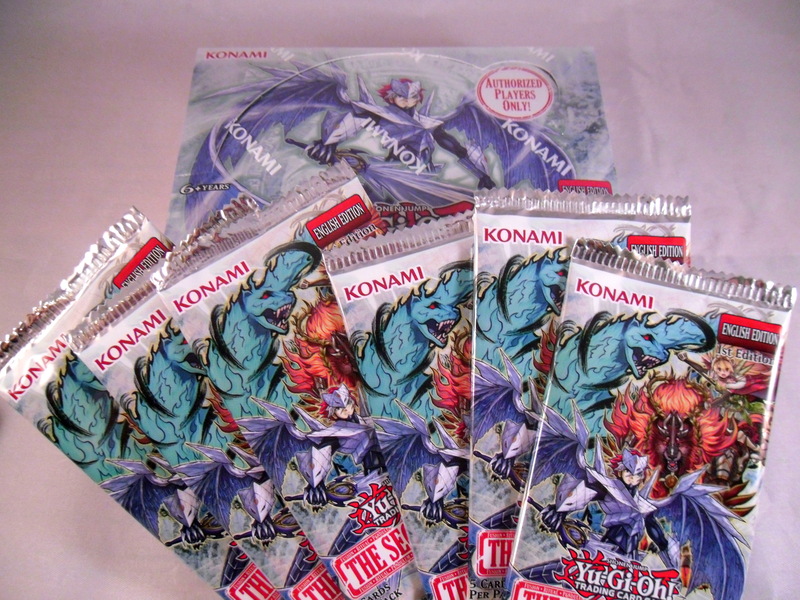 I fully believe Trishula ans Valkurus will follow suit and then hopefully I can buy them both for a more reasonable price. Thanks for reading. There will many more announcements in the coming days. Stay tuned! Tonight I went to my local comic store for another FNM. I told myself to try something different with this draft. So from my 1st pack first pick I attempted to build Abzan. Probably one of my less impressive pools, but it did the job rather decently enough (There was a Pilgirm of the Fires in there also, but I gave it away after the draft). My first pick was the Sandsteppe Outcast (you know you’re over-thinking things when you take a common over your first rare, sorry Archfiend of Depravity). Anyway onto the match-ups. I play a high schooler who I frequently trade with (I owe him for much of my new cards tonight). Game 1 he got colored screwed and I beat him without taking damage. Game 2 he went self-mill into Delve crazy and deck out before he could kill me with Pilgrim of the Fires. Won 2-0 to Control (He very happily told me he played control because he opened Polluted Delta). I played my modern friend. He’s proven to be my toughest opponent in draft so far. Game 1 I opened my big things on curb and wrecked him fast. Game 2 almost seemed like a repeat of the first until he stalled me with Citadel Siege. After which I proceeded to lose Game 2 and ultimately Game 3 to Ojutai, Soul of Winter. I played one of the guys who runs the store. He makes it a habit of always playing Jeskai. We played a very long battle Game 1, however Meandering Towershell proved too strong. Game 2 he used multiple copies of Force Away on the godlike Turtle. Despite this I still swung for game with the turtle. So I went 2-1 and took 2nd place. It was a good night of magic especially due to that crazy high schooler and the combo he was trying to make. 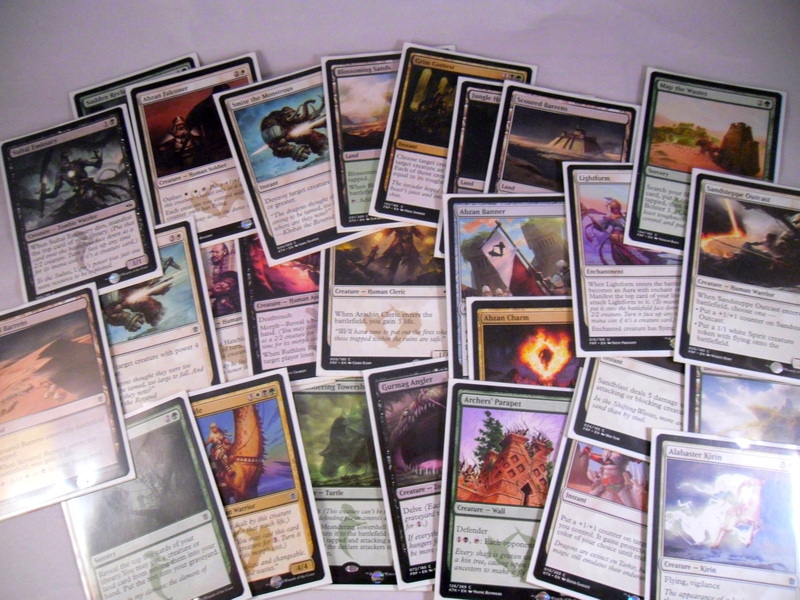 I won’t give it away, but it involved 2 rares from M15 and one of them had alot to do with Mining. I traded him $10 and boat load of $0.25 rares for his Ajani, Mentor of Heroes. along with the vast majority of the above cards. 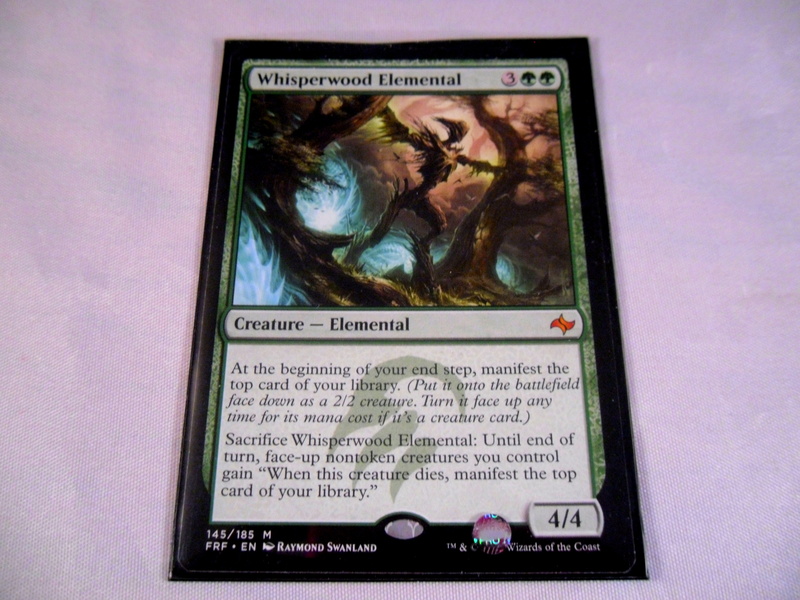 I also opened the Whisperwood Elemental in my victory pack (it’s for sale on Ebay if you want it). Anyway, it was a good night of Magic. I’ve overcome my disdain for the Abzan and will likely play that clan again in the future. Thanks for reading. The 3rd The Secret Forces Box, Can we open another gosh darn $140 Nekroz of Brionac?! I got a 3rd box of The Secret Forces today along with 6 extra packs. I want to say that this set is a very enticing despite its many pitfalls. You can possibly go very plus by pulling Nekroz of Brionac, Valk or Trish. 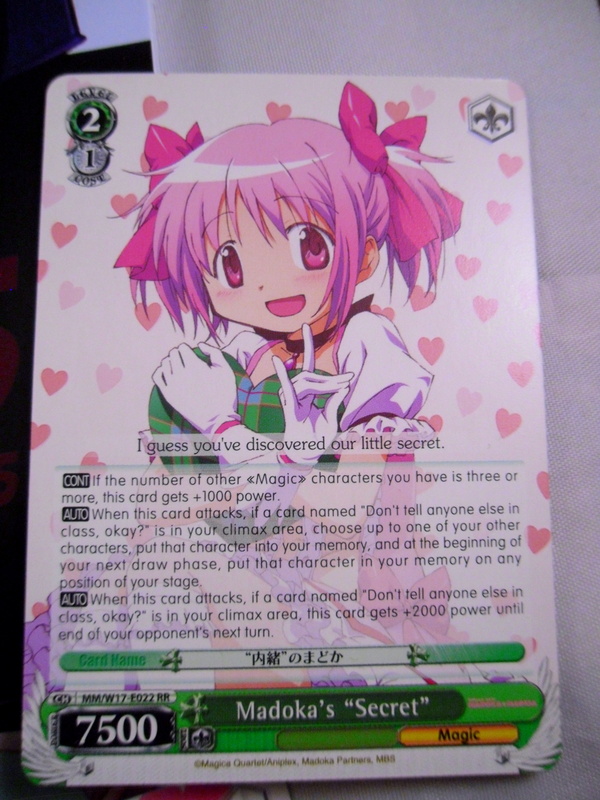 However, due to set ratios you’re far more likely to pull a play-set of Pink Dolphins before you see even single Nekroz card. I got lucky and pulled my 2nd copy of Brionac (currently at $158 on TCGtrader here). This is the most expensive card in the deck. Granted I’m still about $400 away from building the deck. 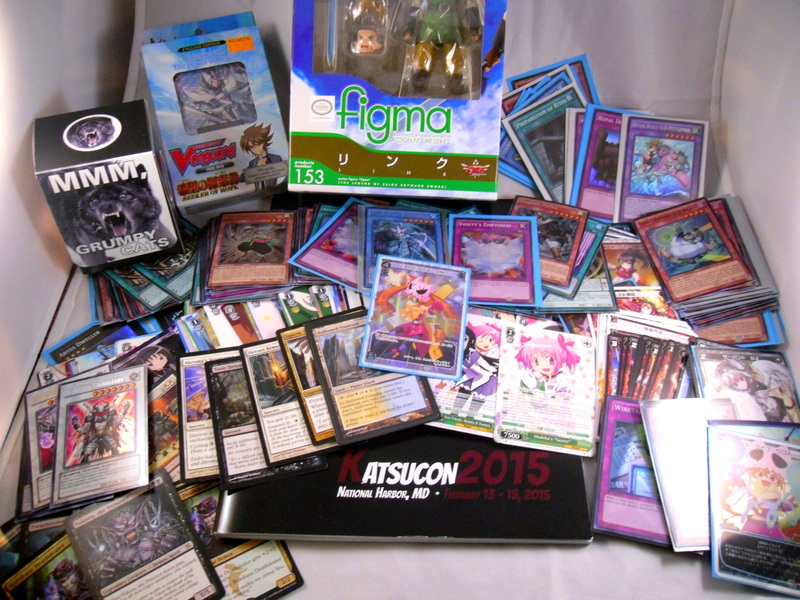 I have no intention of spending that much, but I do want to build this deck which I legitimately enjoy playing. It was a solid box and it’s put me a huge step closer to building Nekroz. Will I complete this deck? Probably not, knowing me and my own sanity. I have a line I don’t like buying single cards for absurd prices. However, we shall see. More site updates to come this weekend. I plan to go to FNM later for my semi-weekly report (while my wallet still lives). What? Blog Updates? You thought I had a plan? So after sadness last night over the lack of new Nekroz, I’ve re-motivated myself. 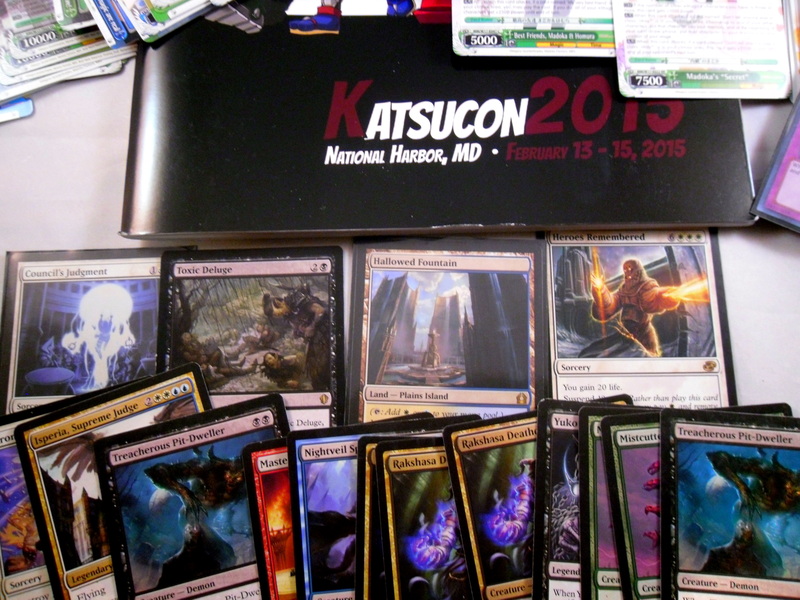 This blog is not just about my experience with TCGs. I want to provide meaningful content, analysis and advice based on the thing that I love. For those reasons I’m going to change how I run things from today on. A look into each of the game’s I’ve started to learn how to play, how they stack up and how much they cost to play both casually and competitively. Game by Game comparisons which I’m going to tentatively name “Head to Heads” where I compare 2 TCGs side by side to gauge their similarities and differences. A full explanation of my Yugioh D&D game which I’m also tentatively naming the “Yugioh Roleplay Scenario” (a.k.a. the Yugioh Big Eyes Small Mouth campaign). As of right now I think I’ll make this into its own blog attached to this one. 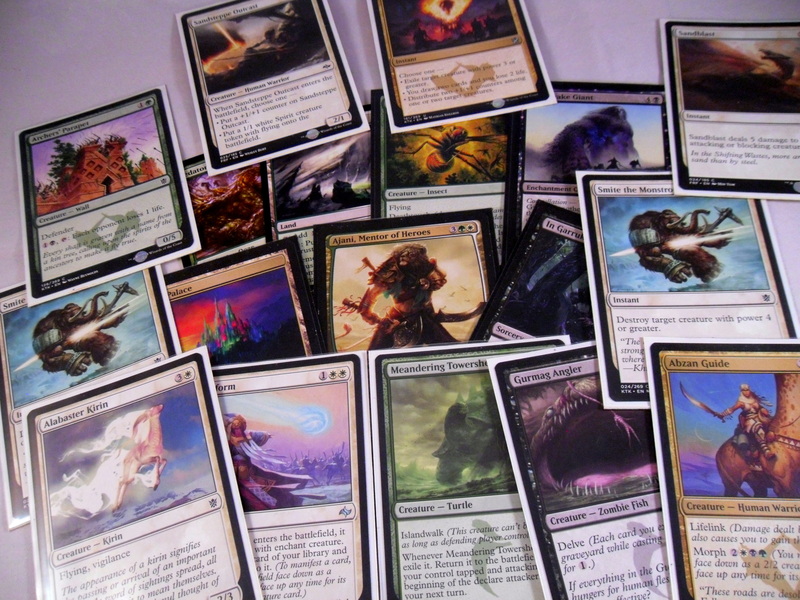 Attempting to prove my own personal thesis that all commercialized trading card games are the same. Whether or not this turns out to be true is something we’ll find out together. I’ll still post about FNMs, box openings and the like, but I also hope to get in at least 2 meaningful posts each week about these amazing pieces of cardboard that have taken away all my money. Thanks for reading, there’s much more to come! 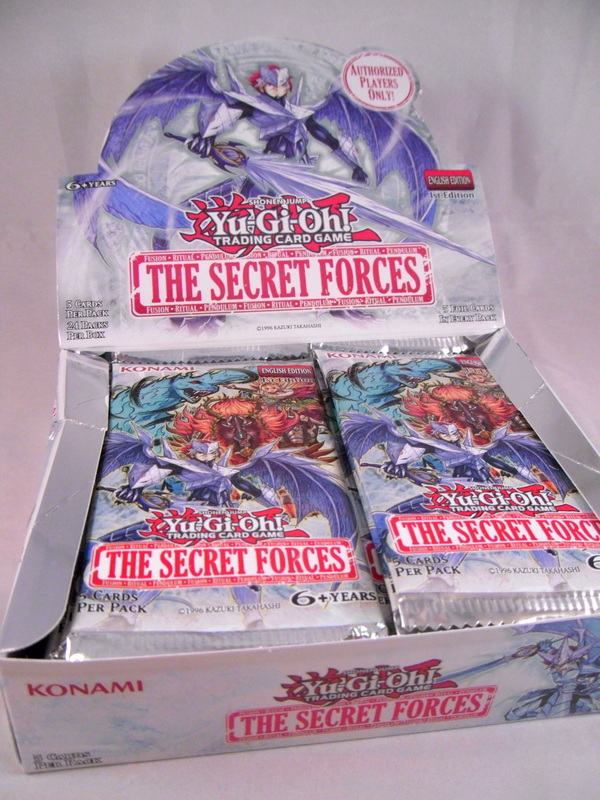 Yugioh Secret Forces Box Opening! Can we find that $140 Nekroz of Brionac?! Someday I’ll stop making posts so late at night that I’m too exhausted to not be brief. I opened my pre-ordered box of The Secret Forces. I was putting my Nekroz ambitions into this box and it largely let me down. 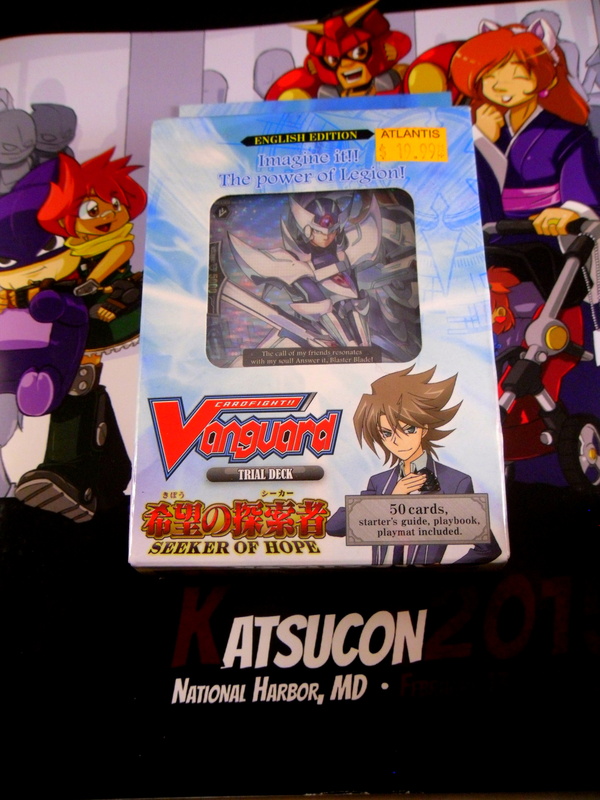 The most valuable card is the Nekroz of Unicore, this box was far less useful than the first box I pulled shown below. 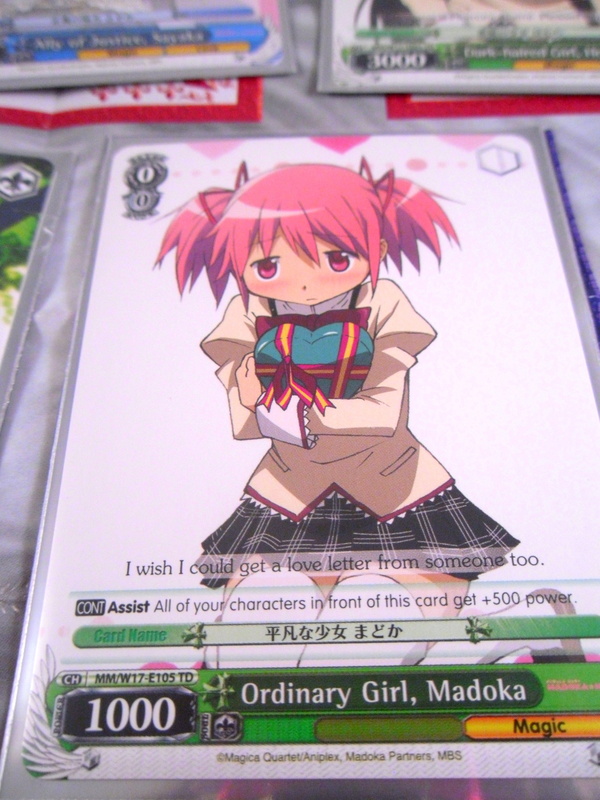 I’m still beyond lucky to have pulled even 1 Nekroz of Brionac in 2 boxes of the set. Though now I’m at an impasse. 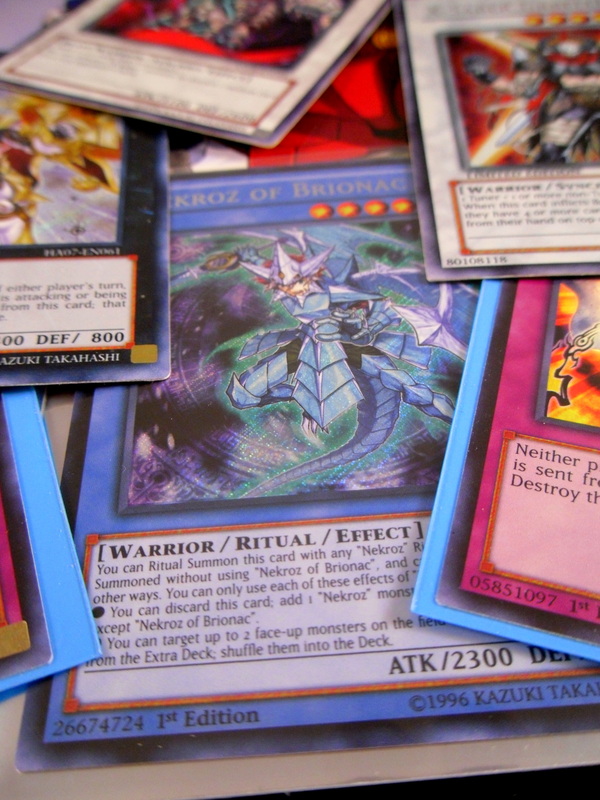 There is little desire in me to play Yugioh competitively. For this reason I really shouldn’t hold on to my Brionac. 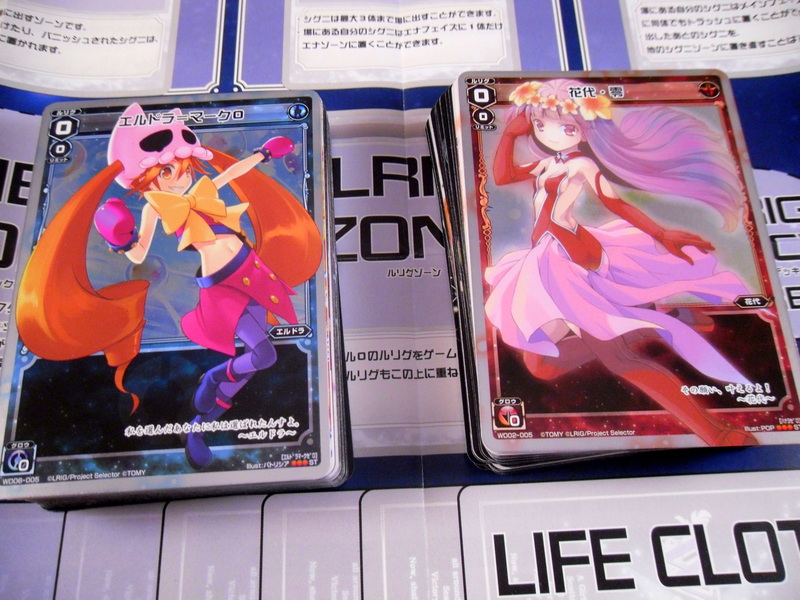 However, I also like Nekroz just as far as cards go. This has left me conflicted and it’s also the first time in my life that I’ve had an expensive card and not wanted to sell it immediately. At this moment I don’t have the answer. 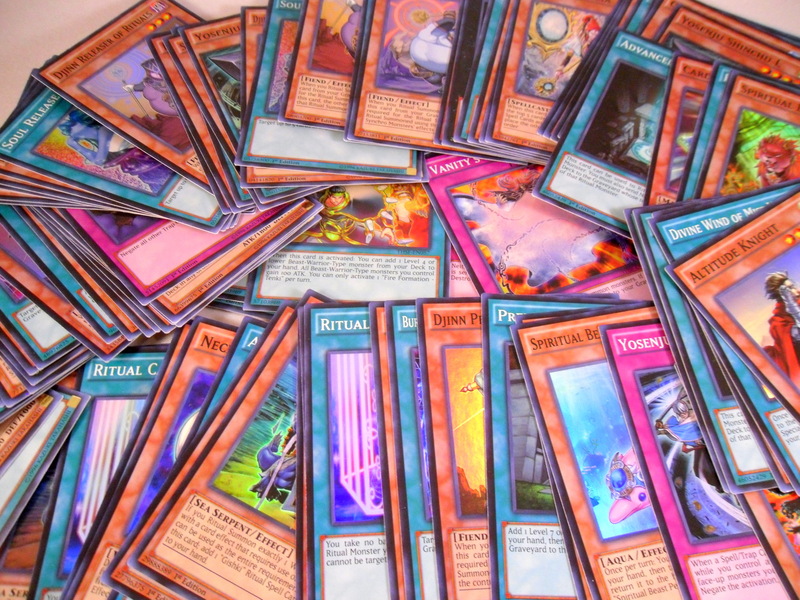 I think I’d rather have a weak Nekroz deck than either drop an absurd amount of money on the remaining pieces or recoup my investment by selling Brio and thus have nothing to show for it. I’ll figure something out in the next few days. The current price of Nekroz of Brionac on TCGtrader as I make this post is $169 as seen here today 2/18. So much screaming internally. Though on the plus side I won a game of Weiss Schwarz earlier. So I waited far too late to do this post. For that reason I’ll discuss my plans in each game very briefly. Also I’ll set out some goals for the near future. I love the art of the Nekroz cards, the fact that they’re actually destroying the Yugioh meta right now is merely another reason to respect them. Infernoids fell through as I never got a copy of Ununcu. Furhermore, the deck never shined competitively. Similarly, Heroes are doing ok on the regional level, but little on a national level . 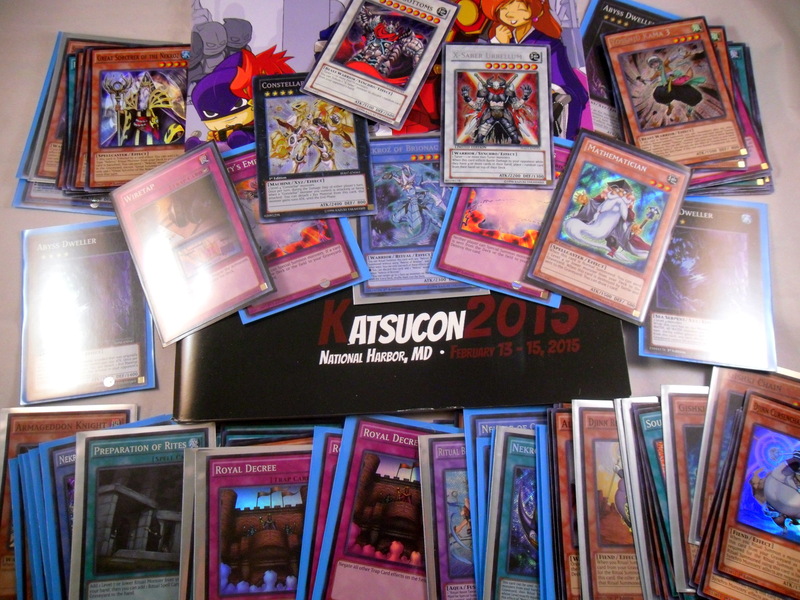 Meanwhile, you have Nekroz running away with 22 of the top 32 slots at the most recent YCS (Tacoma). Now I’m somewhat reasonable and I understand that Brionac is currently worth much more than the box I bought him in. 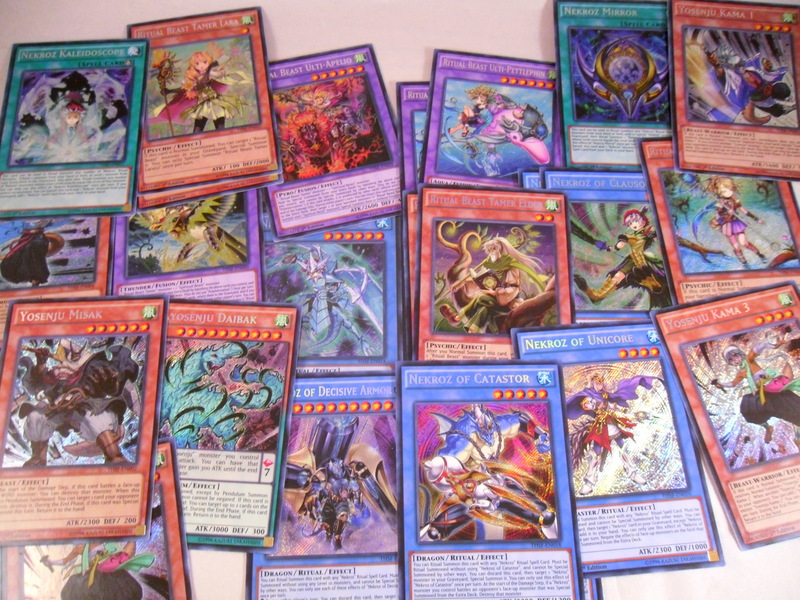 However, my goal was to build Nekroz, not make money off selling cards from the box. 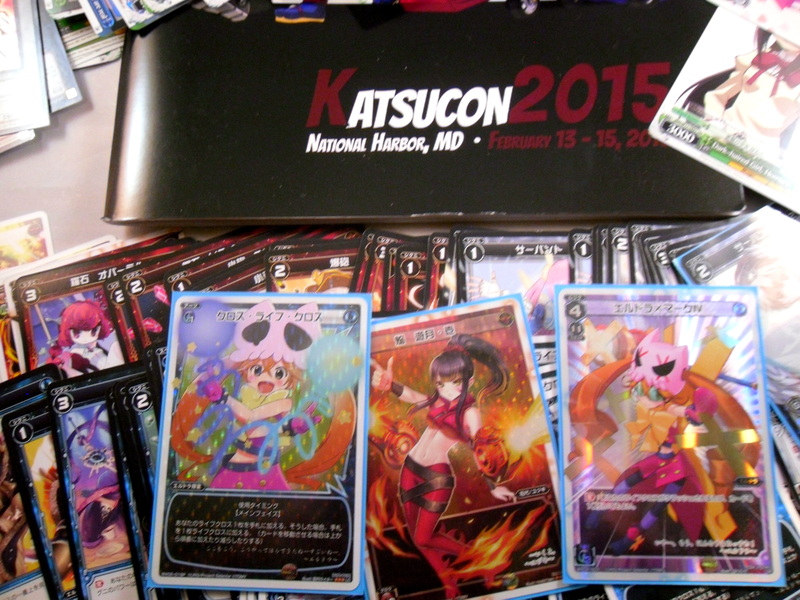 My plans will obviously depend on the 2nd box I open later this week, but for now I plan to build a Nekroz deck. 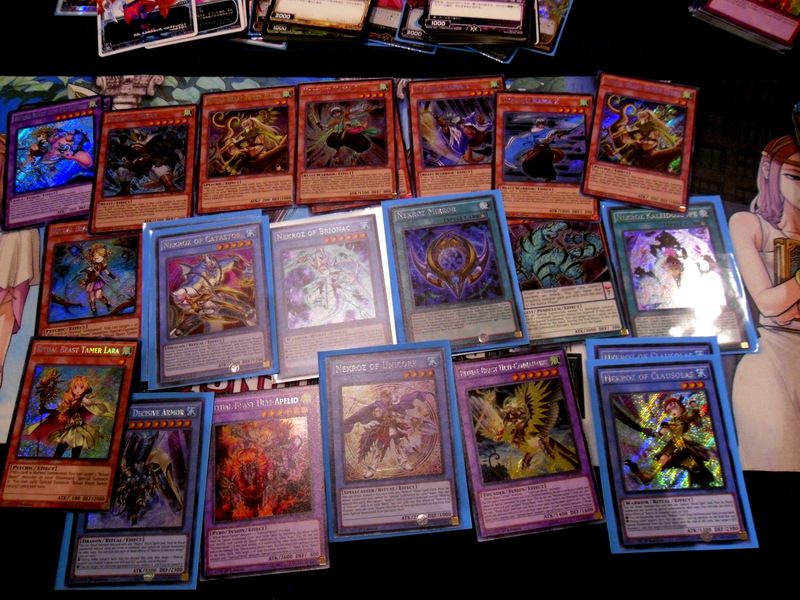 HOWEVER, as I have to be honest with myself I don’t play Yugioh competitively very often. I don’t plan nor want to spend upwards of $300 on this deck, but we’ll see how things turn out. In lieu of finishing the Sultai Whip deck I was working on or the Mardu deck I started, I plan to focus on bettering my current Super Friends deck. I simply don’t have the morale to purchase a playset of Thoughtseize or getting the Power&Profit Clash pack multiple times. Once Theros block rotates out, I’ll be able to make a new standard deck that isn’t shackled to cards like Sylvan Caryatid and Courser of Kruphix. In contrast, my love for Commander has only grown after taking on an interesting group of strangers at Katsucon. Right now my only wish in Magic is too strengthen my EDH deck and the current plan is too add stall (a.k.a. Pillow Fort). 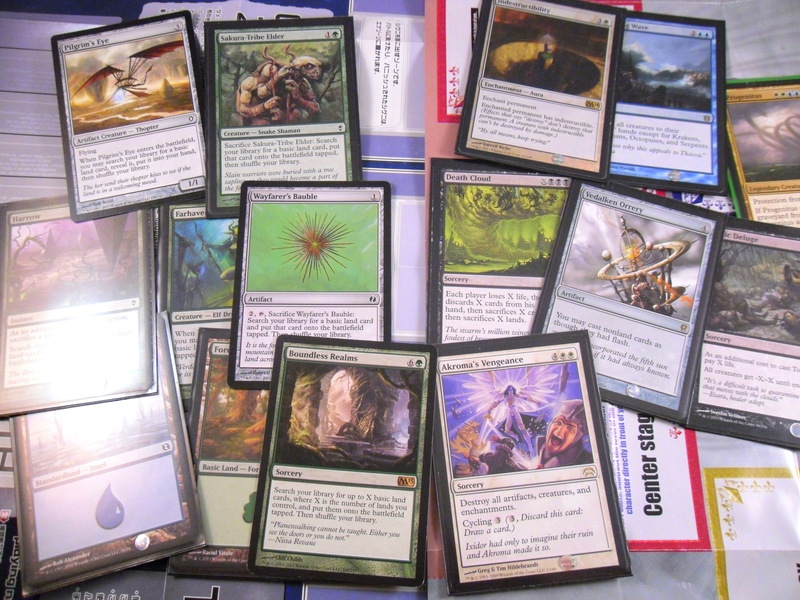 There are about 15 cards in my deck that synergize with the 4-5 basic lands still in my deck. My idea is to switch them all out. The name of the game is protecting my planeswalkers from attacks with my spells instead of my words. 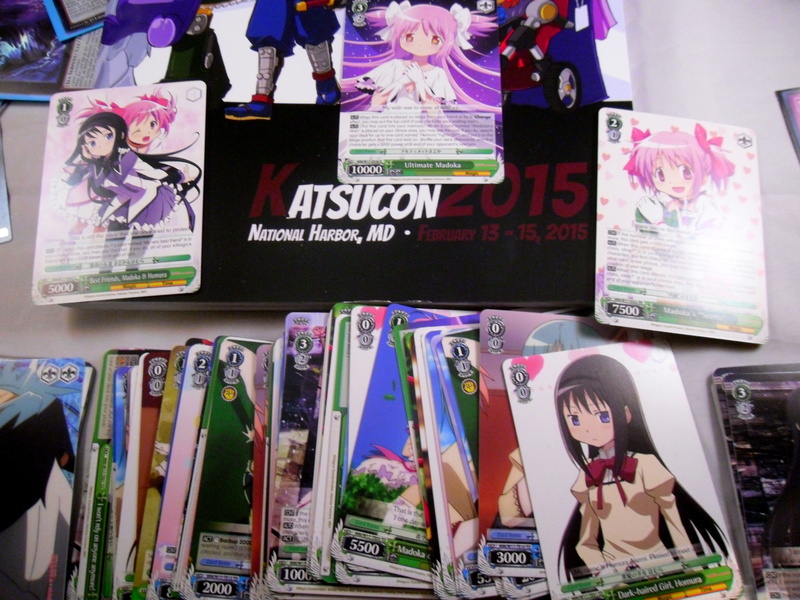 So at Katsucon I bought a Weiss Schwarz deck because I’m a Madoka fan and because all of my friends each bought a deck for their own favorite series. I really like the card art for this game, though it has the most convoluted and needlessly difficult rule set I have ever attempted to learn. I’ll go into details at a later time. 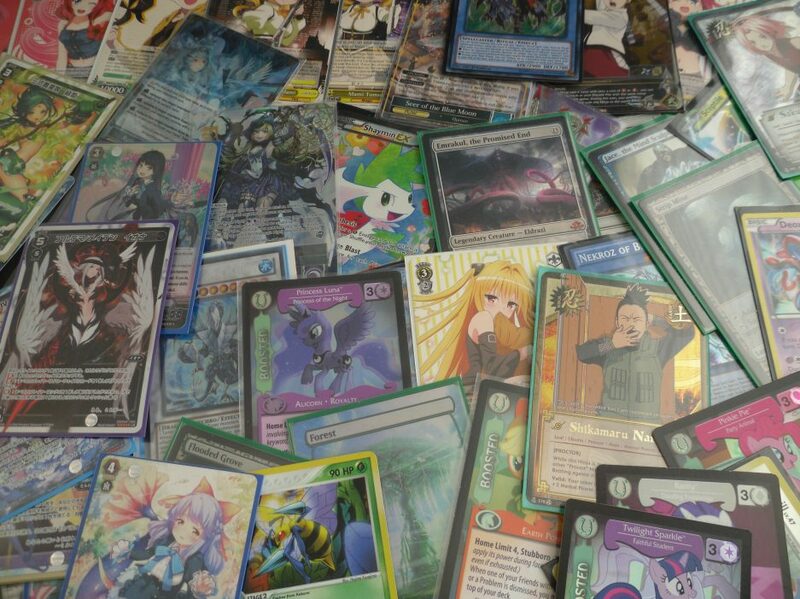 So after 2 weeks of playing Wixoss I still have yet to win a game. However, every match has been an amazing fight and sincerely this game has made me think in a different manner than any TCG before it. I definitely owe an explanation for this game alongside Weiss Schwarz. So as for the immediate future, I want to do more game comparisons. 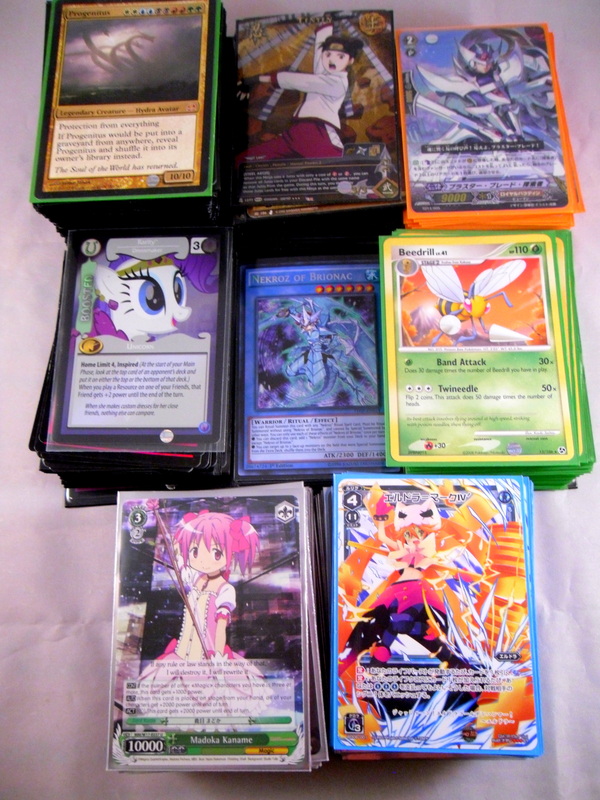 I think expanding my TCG knowledge to Weiss, Wixoss and soon Vanguard will definitely help in my understanding the nature of trading card games. Thanks for reading. I hope to provide some insights soon.